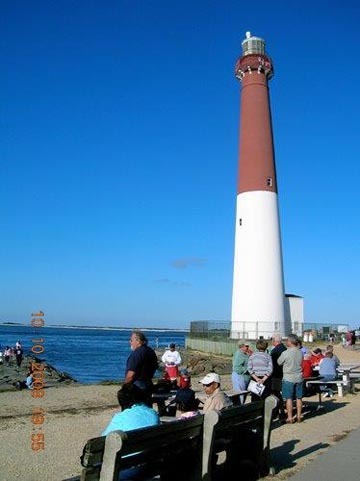 There's always something going on in Barnegat Light, which is not only one of the busiest fishing ports in the United States, but also a favorite haunt for the artists, musicians, environmentalists, and writers. There are more than a dozen eateries within a one-mile radius. There are shops and art galleries, parasailing boats, small boat rentals, fishing areas, evening cruises, a mini-golf course. Bird-nesting areas and wild vegetation preserves are here too.Check out a few leads here, and then branch out from there. The Southern Ocean County Chamber of Commerce, which you'll pass as you enter LBI, is the best place to get an overview of the region, including neat museums like the Barnegat Light Historical Society, or the Tuckerton Seaport Museum! Then, going north toward Barnegat Light, you'll pass renowned Black Eyed Susans restaurant in the town of Harvey Cedars, which features high-quality, locally-sourced, elegantly-presented fare. Continuing north, you'll encounter the the Long Beach Island Foundation of the Arts in Loveladies, which has ongoing classes, workshops, and lectures focused on the resources and health of the ocean and bay. And in Barnegat Light, Viking Village, at 20th and Bayside, runs a fisheries tour every Friday morning in summer, as well as periodic musical events. Then eat lunch at Off the Hook, for delicious fresh seafood , or at Mustache Bill's for diner fare, or grab a sandwich at the Inlet Deli or White's Market. Then a visit to Ol Barney, a game of mini-golf at Jen's Links, followed by supper at Daymark or at the 18th St. Cafe. If it's a Monday night in summer, you can cross the street from Kubel's and enjoy the free summer concert at the gazebo. Also check out Wildflowers by the Lighthouse, at 410 Broadway, just a block from the entrance to the lighthouse park. Owned and operated by Cricket Luker, Wildflowers and Wildflowers, Too are among LBI's most professional and beloved full-service art galleries (framing, workshops, and an array of crafts and gifts to suit many tastes and budgets ). Some of Wildflowers' paintings can also be viewed and purchased at Minerva's. Be sure to visit the Wildflowers duo during your visit to Minerva's! If you're up for a little drive, the Surflight Theatre in Beach Haven is still serving up wonderful live off-Broadway shows! And, as of summer 2014, LBI has a new, sleek, modern publication featuring LBI lifestyles. Check out Bay Magazine or pick up a copy at various businesses on LBI! This is only a teaser! Come to LBI and see for yourself!